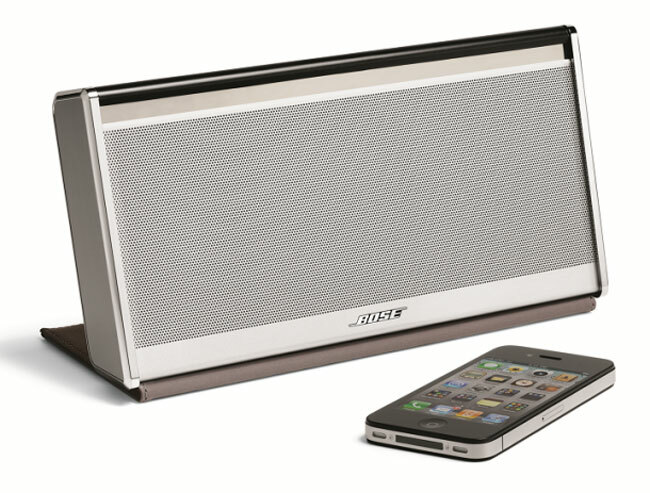 Bose has today unveiled their new speaker dock which was mysteriously announced earlier this week. The new speaker dock is now officially called the Bose Soundlink Mobile and provide a portable speaker for Bluetooth devices. The Bose Soundlink Mobile is equipped with 4 x midrange drivers, and 2 x intriguing “waffle” woofers placed opposite each other and designed to provide powerful bass without making the speaker dock vibrate. Its rechargeable battery will provide around 3 hours of life at full volume, and around 8 used at normal levels says Bose. Using Bluetooth connectivity it enabling you to stream music from any Bluetooth enabled device directly to the speaker and has an optional nylon or leather covers which when in use folds back to create a stand and provide extra support. Size wise its roughly the same as a hard back book. The Bose Soundlink Mobile is available to buy now and starts at $299 for the regular model with a nylon cover, and $349 for the “premium” model with additional chrome trim and a leather cover.